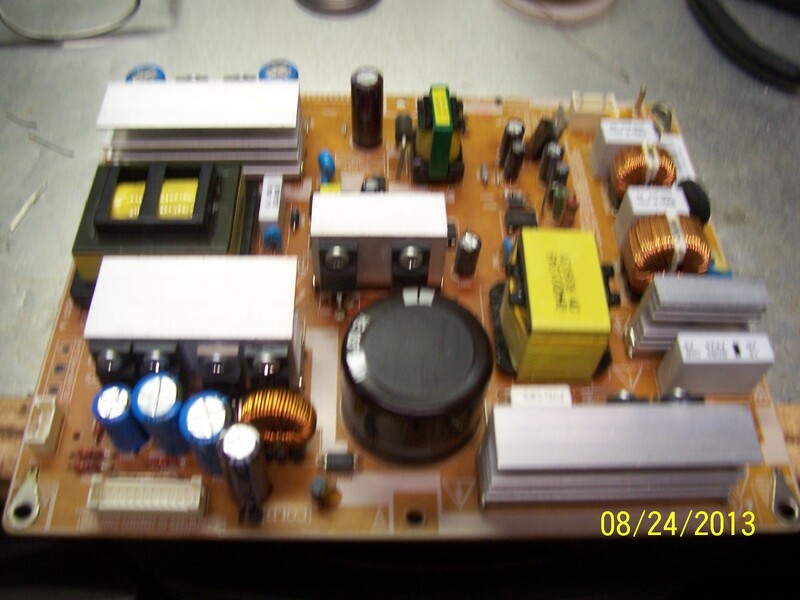 Many causes of failure in the last 10 years or less in switching power supplies that are used in computer power supplies, switching power supplies used on motherboards of computers, consummer electronics can be attributed back to defective manufacturing process used by some electrolytic capacitor manufacturers in the formulation of the electrolyte paste used in the capacitor construction. By the time the problem was discovered by these manufacturers, millions of switching power supplies had been manufactured with these capacitors with a manufacturing defects. Although the problem has now dimished somewhat since approximately 2010, there are no doubt still many computers and consummer electronics out there with these faulty capacitors in them that are like a ticking time bomb just simply waiting to go off or already have started to fail and have not failed completely yet. I have run across this problem in computer motherboards and computer power supplies before. There is even a website out there almost exclusively devoted to this problem and is run by an indiviual that has devoted much research into this problem. That website is called BadCaps.net. What motivated me to document this problem was the recent experience I had. I have a 32 inch Samsung flatscreen TV given to me by a fellow school bus driver friend of mine. She said it would not go on like it should. I initially thought it could be a problematic power supply issue so I took it off of her hands. At first it was only stubborn to power up and so I mounted it on my bedroom wall and waited for it to quit entirely before attempting repair. Shorty after turning the TV on, it would turn on and off, as if it were losing power intermittenly and then finally stay on after running for a while. Finally the TV failed to turn on altogether. Now it was time for a visit to my workbench. Upon removing the backcover, I immediately located the power supply. I noticed immediately seven electrolyic capacitors with swollen tops on them and two of them with paste running out of the top. These capacitors were integral to several switching power supplies. When these capacitors failed they were open and could no longer hold a charge. Therefore the switching power supplies dependent on the charge held by these capacitors could no longer produce any power. 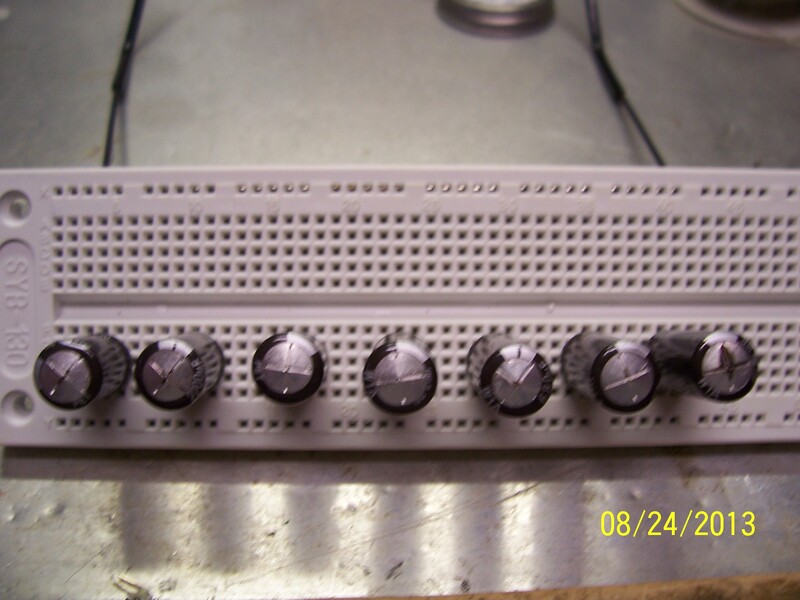 Picture showing the seven bad capacitors on a breadboard. I unsoldered them by removing the solder from the leads of the capacitor with solering wick but being careful not to apply to much heat from the soldering iron, thus damaging the printed circuit board traces to which the capacitors are soldered. After unsoldering the defective capacitors I bought five capacitors new from Radio Shack and unsoldered what appeared to be two good capacitors off of another printed circuit board. I soldered all seven of the replacement capacitors in, being careful to observe the correct polarity when putting them in the printed circuit board or else the new capacitors could explode due to having reverse polarity applied to them. Also I made sure that the new capacitors were the same value in capacitance and voltage rating or slightly higher than the capacitors they were replacing. If you put a capacitor in with a lower voltage rating than the original capacitor you are replacing, the new capacitor could also explode from having excess voltage applied to it as well. I put the power supply board back in the TV and pushed the power button. It turned on just like it was supposed to: power up in about three or four seconds after depressing the power button. Also now the remote control could operate the TV like it was supposed to and would not before the new capacitors were installed. The Power Supply Board with the seven bad capacitors replaced. For more information on these defective electrolytic capacitors in your piece of electronics, go to the Bad Caps Website - http://badcaps.net I wish you success with your bad capacitor replacement projects.